The Subi Reef, part of the Spratly Islands being developed by China for military purposes. The US military has stated that it will continue to operate “wherever international law allows”, a top US admiral said in Beijing on Tuesday. The statement comes just one week after America agitated China by sailing in the vicinity of artificial islands the country is developing in the South China Sea. “International seas and airspace belong to everyone and are not the dominion of any single nation,” the Head of US Pacific Command, Admiral Harry Harris said at the Stanford Center at Peking University. “Our military will continue to fly, sail, and operate whenever and wherever international law allows. The South China Sea is not — and will not — be an exception,” he affirmed, according to a transcript. 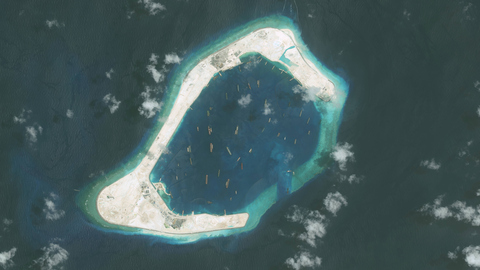 Beijing has constructed an island on the Subi reef of the disputed Spratly Islands. The islands are controlled by China and are being developed for military use however they have also been claimed by Taiwan, the Philippines, and Vietnam. Last week the US demonstrated its navigational policy by sailing the USS Lassen guided missile destroyer within 12 nautical miles of at least one of the land formations China has developed. Chinese officials expressed disapproval over Harris’ words with Fang Fenghui, the People’s Liberation Army chief of general staff telling him it had “created a disharmonious atmosphere for our meeting and this is very regretful”. Washington has said that it takes no position on sovereignty disputes in the territory and the sail-by was undertaken to protect freedom of navigation under international law, which could be threatened by China’s activities. The mission of the USS Lassen was according to Harris a part of the US’s “routine freedom of navigation operations”, with an aim to “prevent the decomposition of international laws and norms”.